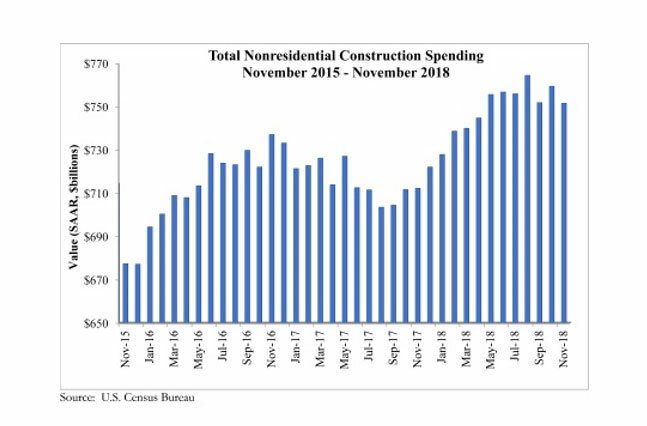 Washington, D.C. — National nonresidential construction spending declined 1 percent in November, according to an Associated Builders and Contractors (ABC) analysis of U.S. Census Bureau data. The release of November data, originally scheduled for Jan. 3, was delayed by the partial government shutdown. Total nonresidential spending stood at $751.5 billion on a seasonally adjusted annualized rate, which represents a 5.5 percent increase over November 2017. However, 12 of the 16 nonresidential subsectors experienced monthly declines. “One of the most interesting and surprising aspect of today’s release was evidence of a dip in infrastructure spending, at least in certain categories,” said ABC Chief Economist Anirban Basu. “Spending on infrastructure was one of the key sources of nonresidential construction spending growth for much of last year but declines in monthly construction spending were observed in the public safety, water supply and educational categories. This pattern is likely to prove temporary, given the healthier conditions of state and local government finances in much of the nation. “The dip in November spending should not be viewed as a leading indicator of coming decline,” said Basu. “The government’s employment numbers indicate that contractors have continued to take on more staff, presumably because there is a growing amount of work to be done. While weather-related impacts are more severe at this time of year, rendering employment and other data more difficult to interpret, the U.S. economy still growing, and with more people working, that should ultimately translate into expanding nonresidential construction spending.